Minnesota’s Wells Concrete has become one of the top five precast/prestressed producers in the U.S. after acquiring key business assets of Denver-based Rocky Mountain Prestress (RMP). The transaction extends a footprint in structural and architectural precast from the Upper Midwest to markets from Canada and New Mexico and Wisconsin to Colorado. 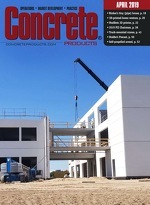 Concrete Products visited the overhauled Rocky Mountain Prestress structural plant in 2007, and Wells Concrete’s Albany, Minn. plant—the most ambitious North American precast/prestressed operation of the decade—two years later. “Wells is a family-owned company in its fourth generation. We are committed to this industry and a long-term view of business relationships. This position is definitely compatible with Rocky Mountain’s culture,” adds Wells Companies Chairman Sam Nesius. A new precast/prestressed operation in Brighton, Colo., projected to open in 2020, will augment production flexibility and capacity in Denver, where RMP has closely located structural and architectural product plants northwest of downtown. Wells Concrete and RMP were founded in 1957 and 1958, and have parallel project logs that include major stadium and commercial developments.